Rudolph Giuliani will wed his companion, Judith Nathan, on May 24 in the ex-mayor's old home, Gracie Mansion. The news was announced Thursday by Giuliani spokeswoman Sunny Mindel. His successor, Mayor Michael Bloomberg, will perform the ceremony. Giuliani, 58, proposed to Nathan, a former nurse in her late 40s, during a November business trip to Paris — five months after he finalized his divorce from Donna Hanover after 20 years of marriage. In interviews last year, Giuliani said Nathan gave him "tremendous emotional support" through his treatment for prostate cancer and as he led the city during the aftermath of the Sept. 11 terrorist attack on the World Trade Center. "We were close already," Giuliani said. "And then we went through hell together." Giuliani and Nathan began appearing in public together in May 2000. Soon after, he announced that he and Hanover were moving toward legal separation. During the legal proceedings leading up to the divorce, a judge ruled that Nathan could not visit Gracie Mansion, the official mayoral residence, as long as Giuliani's children lived there. Giuliani and Hanover have two teenage children, Andrew and Caroline. The divorce settlement called for Giuliani to pay Hanover more than $6.8 million. Hanover, 53, is host of a syndicated television show, "Famous Homes and Hideaways." Last month, she and her fiance — an old high school sweetheart — invited the press along as they went shopping for wedding bands, saying they are planning a wedding in the New York City area this summer. Giuliani's first marriage to his second cousin, Regina Peruggi, lasted about 14 years. It was annulled by the Catholic Church because the couple had not obtained a church dispensation required when second cousins marry. Nathan divorced wallpaper salesman Bruce Nathan in 1992. They have a teenage daughter. The Giuliani-Nathan nuptials will be a first for Bloomberg, who is making an exception from his policy of not performing weddings, said Bloomberg spokesman Ed Skyler. 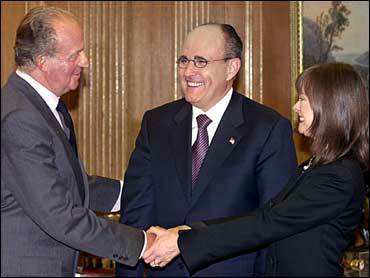 Giuliani regularly officiated at weddings while in office. "The mayor is honored by their request," Skyler said.